It’s been a long time since I had an Easter basket full of goodies to tear into on Easter morning. I still remember the joy of biting off the ears of a chocolate bunny and carefully inventorying the rest of the loot as melted chocolate smeared across my face. The only thing that ever served to diminish the joy was when I would inevitably get a piece of plastic grass stuck on the moist chocolate and unknowingly try to eat it. Oh, the horrors of fake grass floating around the mouth in a sea of messy, melted chocolate! Now, your children don’t have to suffer the way we did. 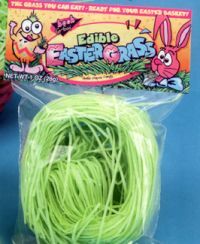 This year, get some edible Easter grass to pad out those baskets, and avoid the misery entirely! Several versions are available, including assorted colors and flavors. Easter’s coming up, so you’d better order soon! Gee, I think I like OTC price much better! This would be soooo cool for some of the items my bakery is featuring for easter. Thanks for the info. This grass stuff is gross, its like stale weakly flavoured foamy potato starch. I just tried the candy grass, it was terrible it tasted like stale ice cream cones. I am glad I didn’t get a bunch. Wow i am actually eating this candy right now and i have to admit that even though it is very cool it tastes..well not very cool, as a matter of fact its terrible. I’ve tried the edible paper at the dollar store and that wasnt bad so i figured this would be like it. It wasnt though, it tastes very stale and not very flavorful of any of the flavors you say it should taste like. Suggestion… make it taste better because it is a great invention! Good job though, its a good start!